“The Recyclers”: Music Education–and Hope–for a Community | Where's My Eraser? Watch this clip. You won’t believe your ears. 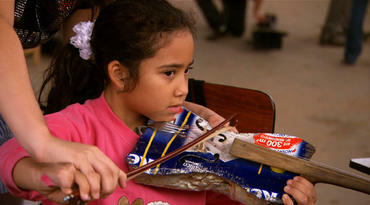 Last night’s episode of 60 Minutes featured a story about a school orchestra in Paraguay. But this is no ordinary group. Their instruments are composed entirely of materials found at the local dump. The rural town of Cateura, Paraguay is so impoverished and jobs so scarce that many locals make a living through collecting recyclables like cardboard and plastic and selling them by the pound. A few choice pieces, however, are destined to lift children out of time and place through music education. A local craftsman, Don Cola Gomez, shapes those pieces together into an unbelievable collection of fully-functional instruments, including strings, woodwinds, and percussion. Favio Chavez, the school’s music teacher, helps students make those instruments sing. The result is indescribable. It produces the most unique sort of cognitive dissonance that I’ve ever experienced. The instruments themselves, with their intense splashes of color and bits of familiar household trinkets, appear to be novel pieces of hand-made folk art. The music these students produce, however, is as good as any produced by a school orchestra anywhere else in the world. It’s hard to believe discarded materials, trash, can create anything so beautiful. The Recycled Orchestra of Carteura is the subject of the upcoming documentary landfillharmonic. Reblogged this on Put the Art Back In Education . Glad you like the post! What a fascinating story.